of the 3rd tactical wing of the 7th Fleet, code name Nova. The following vessels will now report to you. 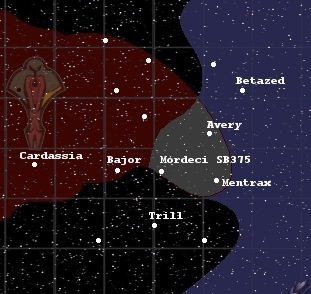 As I'm sure you aware, the Cardassian Union, once known as the Commonwealth have invaded federation territory. This map displays the area they seized. 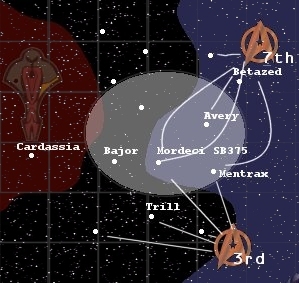 The Cardassians managed to take Mordecai, Avery And Mentrax in their initial invasion. This is the Plan. The 7th and 3rd fleets have been mobilized to counter the Cardassian Invasion. The 7th fleet will first secure betazed and set-up fleet operation. The 3rd will set up operations in the Trill System, who have sided with the Federation in this conflict. Along with the 3rd we will secure non-inhabited planets. Then comes the fun. We must retake the Mentrax, Mordeci, and Avery Systems. The 7th will be taking these systems. Your Wing (Nova) will enter the Mordecai systems first, you will engage any Cardassian ships and draw them away from Mordecai Prime, The Alpha Wing will then enter and support the assault. Alpha will have larger class vessel so they will make the main assault. During our counterattack the 3rd fleet will swing around our positions and cut off the Cardassian supply lines. If this works we'll secure all systems lost and damage the Cardassian Fleet enough to force a peace. 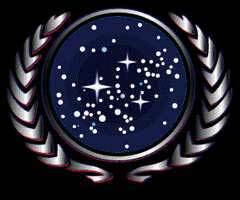 The Federation Council has not been able to contact the new Cardassian government, so their is no chance of a peaceful ending, we must protect Federation Citizens.